As I have been a monk, there have been many miracles that have come my way when I needed them the most. For the Christians out there, they might say, “Doesn’t that make you believe in God?” My answer is, “It makes me believe there are heavenly beings (Devas & Devis) who are looking out for me.” Here are a five remarkable stories to retell, but not all of them. For instance, “My Watch Story” is not included. Within a few days of arriving in Kauai for the second time as a monk in 2018, I wanted to go and visit a Thai restaurant that used to feed me on Thursdays three years ago. It was always a “sure thing” to get food there and all I would need to do was stand outside until they saw me. However, it was three years ago since I have seen them last and I heard on the bus that the restaurant had moved to a new location in the same town of Kapaa. One day, I was over at my helper’s house in Kilauea making some signs to help with my efforts to advertise where I was going (sort of like hitchhiking). I used my his laser printer and made a bunch of printouts with the village names and I wanted to glue them to cutout cardboard signs. After I was finished printing, I asked my helper who seems to have just about anything if he had any glue. He said he did not have any glue and I left the house wondering how I would finish my project. “Perhaps I will use package tape,” I thought to myself. Only 20 minutes later, I was walking down the street when I passed the local church thrift store across the street from the Shell Station. A person who was dropping off some unwanted items saw me and called out from a distance, “Hey! Do you want some junk?” I’m always interested in things that can be donated to me, so I approached him. In the back of his pickup truck were a few boxes that he was unloading. Inside one of those boxes was a bottle of white school glue, but I wondered if it was included in the unwanted items that he was donating to the store. I then pointed to that particular box and said to him, “Is this box also junk?” He reached into the box, picked up the bottle of glue (among many items), and said, “Why? Do you want some glue?” I said “Yes,” and he handed me the glue. I could not believe the coincidence myself but there it was! Another day I was trying to get to Kilauea from a location in Princeville with my newly created signs. It was not an easy location to get a ride because the cars are going very fast at that location, and there is little room to pull off the side of the road. It started to rain, which made it more difficult to get a ride because who wants a wet monk to ride in his car, and it was all the more difficult to stop. Not only that, a bunch of road work was happening and the road workers placed “Road Work Ahead” signs right in the places where a potential ride could stop for me. It was a Tuesday, and it was getting late for my usual 8:30 a.m. arrival time to start my alms. It was also a special day because my helper who usually subsidizes my Kilauea alms was in Honolulu for the day visiting a friend who was recovering from a stroke. Not only that, there was a problem with the Subway sandwich shop and they were not accepting internet or credit card orders. I had no backup to subsidize my alms in Kilauea. I was waiting and waiting by the road and it seemed hopeless until a truck pulled over with a Thai driver. He said, “They don’t know how to treat monks.” and asked me to get inside. He drove me to the Kilauea Shell Station even though he was going the other way. He invited me inside the small convenience store called, Menehune Mart next to the Shell Station. I still remember what he bought me. There were 3 Musubis (a local favorite), one breakfast burrito, 3 bottled drinks and 1 water, and 2 apple fritters. That day, I happened to receive nothing on my alms round except that wonderful gift from that Thai person and I ate all of it. A week later, he arrived at our meeting at the Thai restaurant in Kapaa which eventually opened again. He lives in Kapaa, but usually goes to Princeville on Thursdays to do some landscaping. However, that day, he had a meeting and changed his schedule to go to Princeville early on Tuesday morning, the day that I really needed to see him. If he had not changed his schedule, he would have not seen me and I might not have been able to eat that day. On my second day in Kauai, I decided that I should go see the homeless outreach lady and declare myself as homeless which would allow me to declare residency without a physical address. My helper sent me off with a bus pass and 2 apples while I would need to find the rest of my meal somehow, and somewhere. I had no exact plans, but I started by going to the office building where the homeless outreach lady works. I had made an appointment to see her after 12 noon since she was doing her rounds in the beach parks and then started to think about my meal for the day. The question was where I would get my lunch. Earlier, while I was looking for the office, I met a homeless person in the park across the street from the homeless shelter. He had told me about a supermarket which does not call the cops on homeless people, and I had thought about getting my meal there with my bowl. I was using GPS and Google Maps, but it did not seem to help much. I was lost at an intersection and asked a person who was crossing the street where this certain supermarket was. He asked me why I wanted to go to that particular supermarket when a closer one was near bye and I told him that it would be safer to collect my meal there. It turned out that although he was clean shaven and dressed with clean clothes, he was homeless himself. He had a nice gig living on piece of property nearby in a hammock and seemed to be well kept. He knew the circuit and asked me if I ate meat. I told him it was not a problem. Then he said, if I wanted to go to the Salvation Army for lunch he would take me. It would be a 30 minute walk and they were serving free Chicken and Rice plates in about the same time it would take to walk there. I agreed and we walked together. He had a story, just like we all do. He had hit his head once and that was how he “woke up.” He told me that he had a guide inside his head who would tell him what to do. He was also looking on the ground for partially used cigarettes and screamed with joy when he found a new cigarette on the ground that only had one or two puffs used from it. He lit it up in front of me as we walked and talked some more. When we arrived, they were about to serve the food and there was a group of homeless people waiting. They were the same people that I was now going to be labeled as, after 12 noon, when I meet with the homeless outreach lady. It was humbling to be homeless in this way which is technically what separates a monk from a householder. There was someone singing inside and a bunch of people waiting outside beside a picnic table. We chose to wait outside and several of the homeless people approached me with questions. My ego told me I was different, and I guess I was since I was the new kid on the block complete with robes and a bowl. My newly made friend was vegetarian and not hungry, so he gave me his portion while I took my own too. I had a full belly that day. I also had a source for a hot meal on Tuesdays and Thursdays while the Kapaa Thai restaurant was closed. On my way back from another visit to the Salvation Army kitchen, I got lost trying to find the shuttle bus to take me to the North Shore Bus. Along the way, I noticed a Mobile Thai restaurant called Anatta’s. The next time I went to the Salvation Army, I went early to see what would happen if I could stand near this Thai Restaurant. If it worked, then I would skip the Salvation Army that day. If it failed, I had chicken and rice as a backup. After about 3 minutes of standing, the Thai owner came out with her cell phone. She was speaking with a Thai lady from poipu whom I had known from my trip three years ago. She asked some questions and then relayed my answers over the phone. Then she asked me where I was going to get my meal. Because nothing was offered yet, I told her I would get my meal at the Salvation Army. She smiled, and said that she would feed me. That was the last time I went to the Salvation Army. One time while I was attending a university called ITBMU in Yangon, Myanmar, I asked a Sri Lankan friend for a mala (rosary beads) to help with some texts I was trying to memorize. Although he did have one, he needed it and did not have an extra one for me, so I went without one. If I had a mala, I could use it to count how many times I repeated each line to “burn it in” my memory. Shortly after that day, I was on my way back from my piṇḍapata (alms round). On my way back, it was my habit to go to Swe Daw pagoda (Tooth Relic Pagoda) to meditate before returning home. After my meditation, and while I was walking back, a motor bike stopped and tried to offer me money and then I said my favorite line… “Paison makhainboo” (I do not handle money). He smiled with a tilted head, and closed eyes towards the sky, and then I joked to him, “Paison ma-ponboo.” (I do not eat money.) He gave a nodding smile and then sped away. As he left, another bike stopped before I could take a few more steps. Motorbikes stopping on the road like this is not so common. As I was prepared to say my line again, this new rider pulled out a mala or string rosary beads to offer me. I told him “ubazin alosheedeh” (I, the monk, needed this). Afterwards, I went to my Sri Lankan Friend’s dorm room and reminded him about my request for a mala. Then I pulled out the mala and asked him, “When was the last time you heard of monks getting malas on piṇḍapata?” He rebutted with a better question, “Has any monk ever received a mala on piṇḍapata?” We both smiled because we knew “someone” had heard our conversation the other day. Just in case you did not understand the choice of the post’s title, it is a wordplay on a famous movie. Go ahead and Google “Miracle on 3 or 4 Streets” and you will see the famous Christmas Movie. 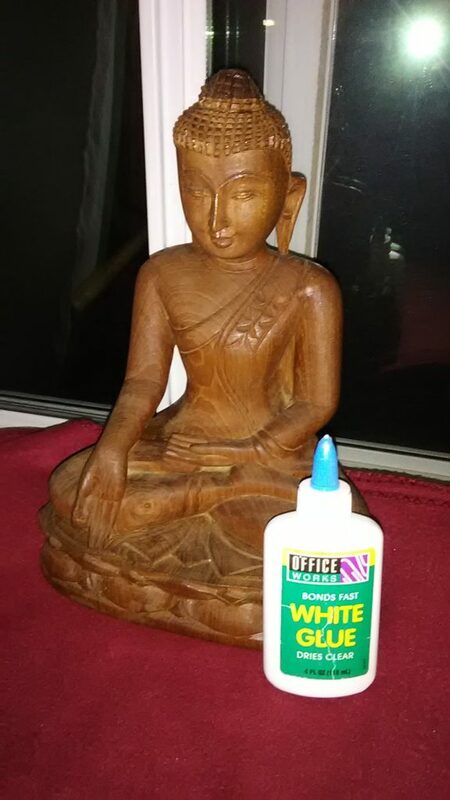 The picture of the bottle of “White Glue” was of the same bottle that I received in the story above. Have you watched Propagation in Kauai? It is a one hour video (2 parts) that explains what I did in Kauai in 2015 and what I am doing now again. Sadhu! Sadhu! Sadhu! Great stories Bhante!